Fighter and coach Daria Albers now calls Physical Culture Collective in Brooklyn her home gym, but the universal athlete has long spent her time traveling and training around the world. As a 19-year-old in Germany, Albers used the sport of Muay Thai to overcome the judgments of others as well as her own fears. Her journey’s origins was filled with adversity. As one of the few female fighters in her gym in Europe, she had to stay strong against men and women who would go out of their way to either be very aggressive with her during training or who would simply refuse to train with her at all. This treatment lasted several years, but Albers kept her head high and focused on the goal: being the best that she could be. “My road to Muay Thai started a bit bumpy,” Daria says with a laugh. “I met a guy who I really liked, but he told me I am fat, so he couldn’t date me. At that time, he was a professional fighter. I was so hurt, but also felt challenged to do something about that. I didn’t want to lie down and cry. I wanted to do something about my feelings and my body. So finally, after being to scared to enter the gym for a month, I took the first class. My treatment got even worse because the team I trained with were ignorant, very close-minded, and a bunch of bullies. In the first 3 years of my journey, I fought many challenges and overcame them all because I learned one very important thing: Nobody can tell you what you are capable of or not. It’s all about yourself, how real you are to yourself, and how much you want it. And if you keep going, you will find talents and skills inside yourself that you never have even dreamed of. 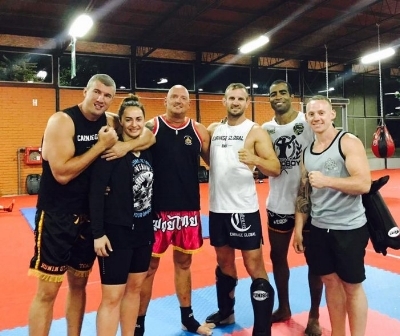 Albers has fought, trained, and taught all over the world, including most of Europe, South Africa, China, and Russia. She says, “As a coach you need to understand the diversity of characters, the different cultural backgrounds and the social environments where people come from. You need to read them and adapt as a coach how you communicate, how you instruct, and what you instruct. As a physical therapist and mind coach I do read people’s body language, I analyze their movement patterns and their minds, so I can adapt my training in a way, that everybody gets the best out of their training. I am the second pair of eyes in the ring and on the mat for my students. At the end of the day, Albers is just looking to inspire as many people as possible. As a role model for women, Albers finds it critical to not only boost others’ self-esteems, but to maintain a healthy one for herself. Confidence and perseverance is key for her to accomplish her goals and she encourages others to find the power within themselves to make their own life.